This yummy recipe is adapted from the High Flavor, Low Labor cookbook I’ve been so excited about lately. This cookbook is a must buy! 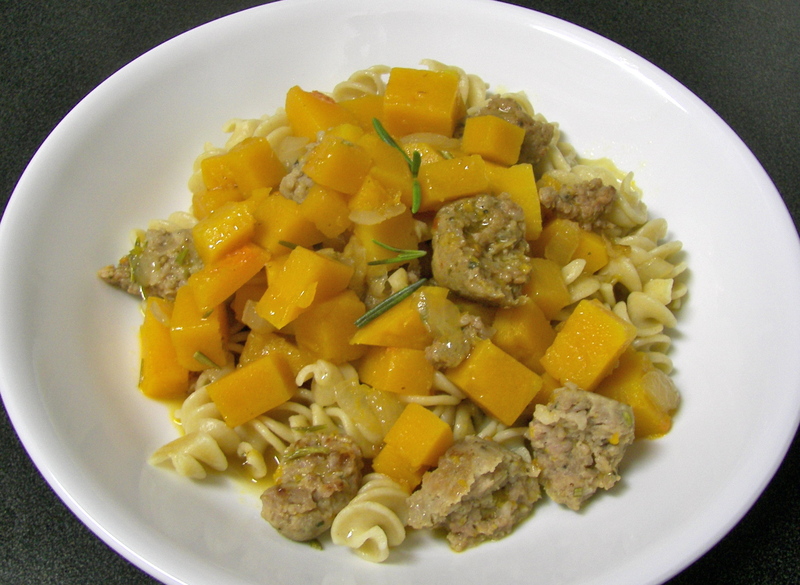 The combination of the spicy Italian sausage and the sweet butternut squash is just perfect. Bring a large pot of water to a boil, and add the pasta, cook until tender. Drain. While the pasta is cooking heat some olive oil in a large skillet and add the onion, garlic, and sausage. Saute about 4-5 minutes breaking up the sausage into small chunks. 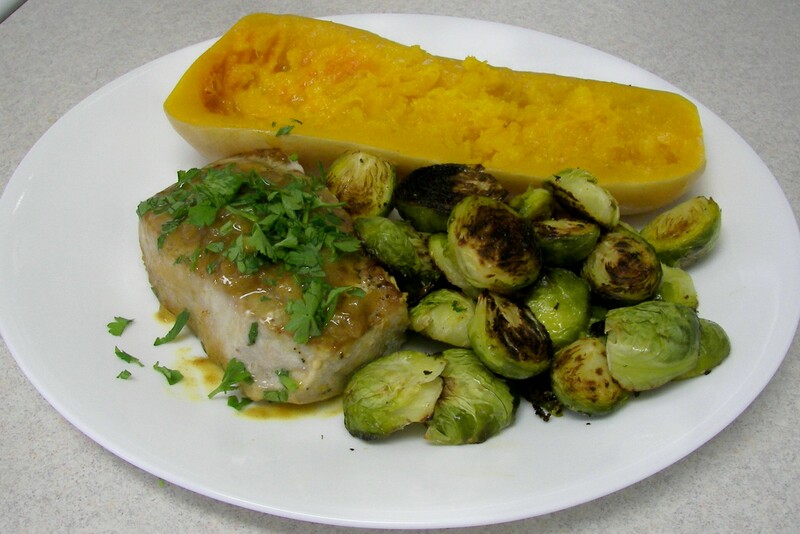 Add the squash and rosemary and saute 5 more minutes. Add the chicken broth and scrape up any browned bits from the bottom of the pan, cover and simmer until squash is tender. Remove the cover and cook until the broth is almost all gone. Add the pasta, season with sea salt and freshly ground pepper. MMM Good! This was another one of those nights where things just didn’t quite go as planned. The recipe was Roasted Pork Loin with Parsley-Shallot Sauce from the always wonderful cookbook, The Food You Crave by Ellie Krieger. I had made this recipe before and it is really yummy. When I was getting ready to make dinner I realized I didn’t have any parsley or shallots, so there goes the sauce. I decided to cut the pork loin into pork chops, and sorta followed the recipe from there. Here is what I did…..
Mash the garlic and salt together to form a paste, transfer to a small bowl and combine with the olive oil, herbs and pepper. Rub the paste all over the pork chops. Transfer the pork chops to a roasting pan and roast until 155F (about 20 minutes, depending on how thick the chops are). The pork was still really yummy even without the parsley shallot sauce. 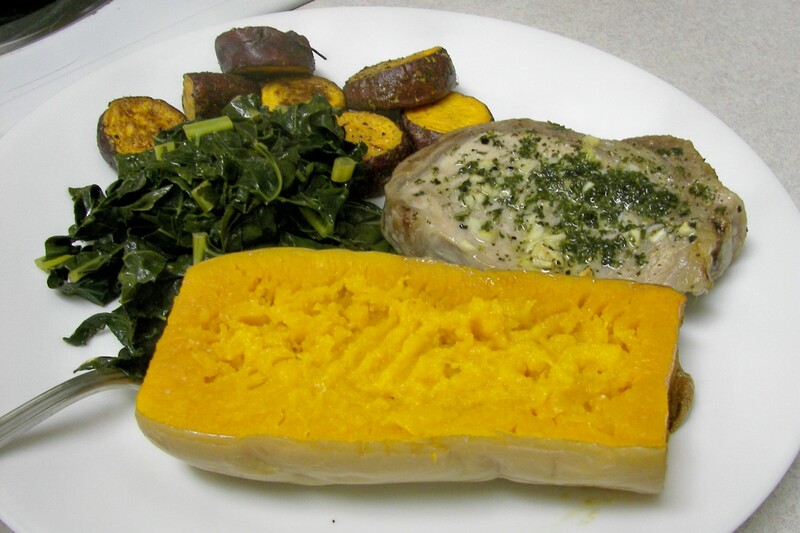 I served this with some kale sautéed with garlic, some roasted sweet potatoes and roasted butternut squash.